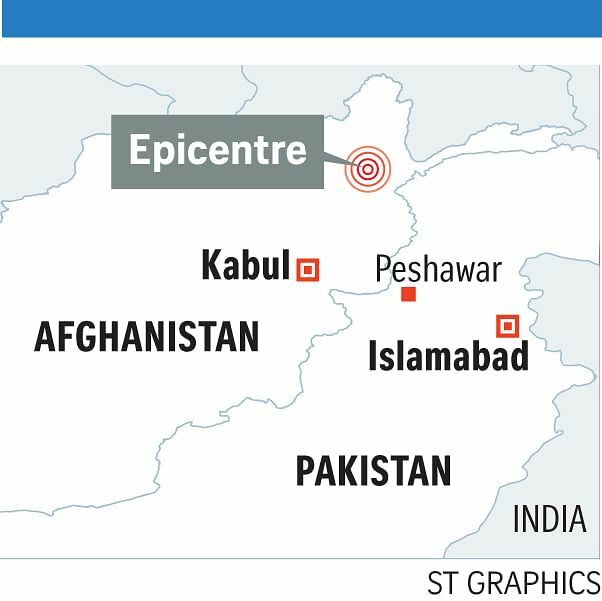 KABUL/PESHAWAR • Afghanistan's strongest earthquake in over six decades killed more than 160 and injured over 1,000 across South Asia, prompting officials from Kabul to Islamabad to New Delhi to send out rescue teams in search of survivors. At least 31 people were confirmed dead in Afghanistan yesterday, while 135 were killed in neighbouring Pakistan, officials said. The death toll could climb in the coming days because communications were down in much of the rugged Hindu Kush mountain range area where the quake was centred. "The strongest earthquake in recent years has caused heavy damage and casualties in the nation," Afghan chief executive officer Abdullah Abdullah told the country in a televised address. Afghan President Ashraf Ghani convened an emergency meeting to assess the damage. Indian Prime Minister Narendra Modi called for an urgent assessment of the quake and said his nation was ready to provide assistance. Pakistan said its army had begun rescue efforts. Reports of deaths had poured in from different areas by nightfall yesterday. In one of the worst incidents, at least 12 girls were killed in a stampede to get out of their school in the north-eastern Afghan province of Takhar. Shock waves were felt in northern India and in Pakistan, where hundreds of people ran out of buildings as the ground rolled beneath them. "We were very scared... We saw people leaving buildings and we were remembering our God," Pakistani journalist Zubair Khan said by phone from Swat Valley, north-west of Islamabad. "I was in my car, and when I stopped my car, the car itself was shaking as if someone was pushing it back and forth." The quake was 213km deep and centred 254km north-east of Kabul in Afghanistan's Badakhshan province. The United States Geological Survey measured its intensity at 7.5. Just over a decade ago, a 7.6-magnitude quake in another part of northern Pakistan killed about 75,000. Particularly hard-hit in Pakistan was the northern province of Chitral, where 11 people were killed, police official Shah Jehan said, adding that the death toll was likely to rise because so many areas were cut off from communications. Journalist Gul Hammad Farooqi, 47, said his house collapsed. "I was thrown from one side of the road to the other by the strength of the earthquake. I've never experienced anything like it," he said. "There is a great deal of destruction here and my house has collapsed, but thankfully my children and I escaped." Further south, the city of Peshawar had one death, but at least 150 injured people were being treated at the city's main hospital, the provincial health chief said. In Afghanistan, international aid agencies working in northern areas reported that cellphone coverage in the affected areas remained down in the hours after the quake. Badakhshan provincial governor Shah Waliullah Adib said that about 400 houses were destroyed, but he had no figures on casualties. The quake struck almost exactly six months after Nepal suffered its worst quake on record, on April 25. Including the toll from a major aftershock in May, 9,000 people lost their lives and 900,000 homes were damaged or destroyed.